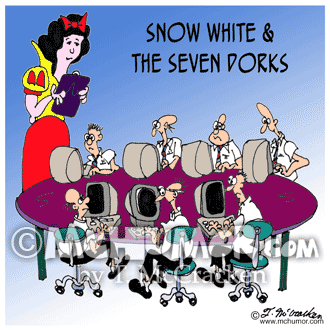 Computer Cartoon 6764: "Snow White and the Seven Dorks." Snow White surrounded by short nerds at computers. 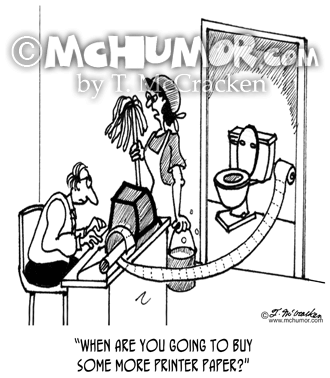 Paper Cartoon 2852: A cleaning woman says to a man using toilet paper in his printer, "When are you going to buy some more printer paper?" 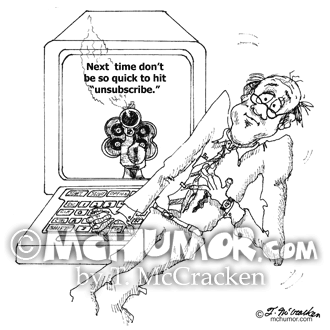 Computer Cartoon 8767: A thief stealing a computer saying to another, "No, no. 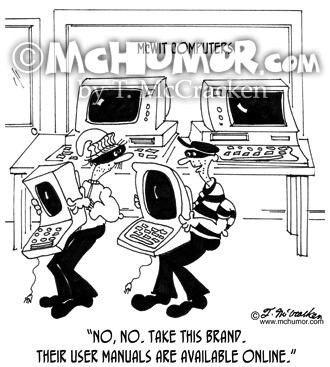 Take this brand. 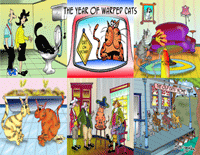 Their user manuals are available online." 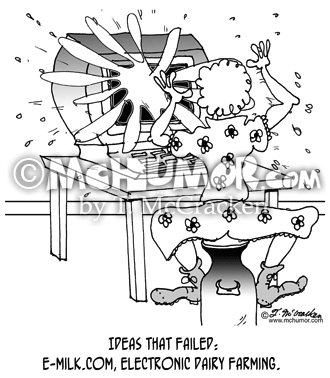 Milk Cartoon 7785: "Ideas that failed: E-Milk.com, Electronic Dairy Farming." 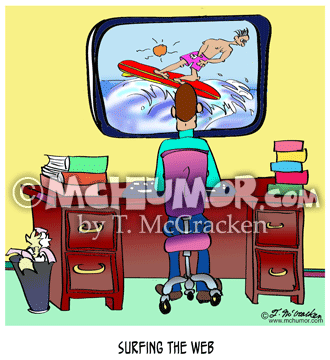 Milk shoots out of a computer. 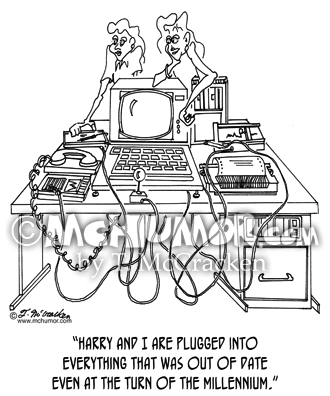 Technology Cartoon 1389: A woman with and old computer equipment and cables running everywhere says, "Harry and I are plugged into everything that was out of date even at the turn of the millennium." 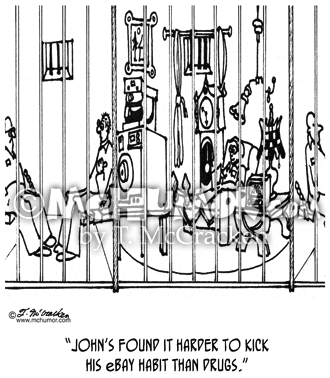 Prison Cartoon 3338: A prisoner says of another with tons of stuff in his cell, “John’s found it harder to kick his eBay habit than drugs." 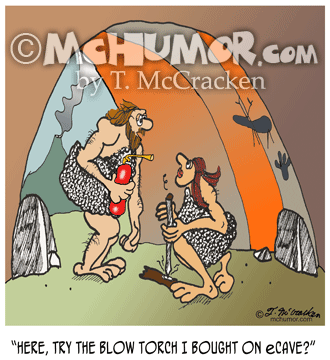 Fire Cartoon 3189: A caveman says to another trying to start a fire by rubbing sticks together, "Here, try the blow torch I bought on eCave?" 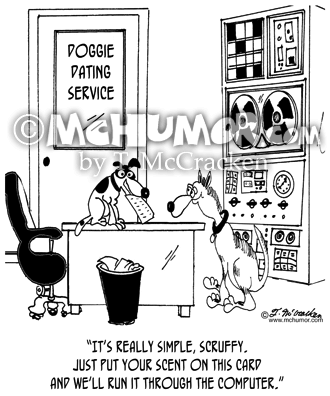 Dog Cartoon 8284: A receptionist at "The Doggie Dating Service" hands him an old computer cards and says, "It's really simple, Scruffy. 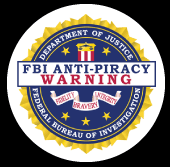 Just put your scent on this card and we'll run it through the computer."